African leaders have agreed to establish a new court to bring justice to the Sudanese region of Darfur. The hybrid court would consist of Sudanese and foreign judges appointed by the African Union in consultation with the Khartoum government. US-based Human Rights Watch told the BBC the new court should not replace the International Criminal Court. The ICC is seeking to prosecute Sudan's President Omar al-Bashir for committing war crimes in Darfur, which he denies. A rebel leader is currently on trial in The Hague and the court has also issued arrest warrants for a Sudanese minister and pro-government militia leader. Violence flared in Darfur in 2003 when black African rebel groups took up arms against the government in Khartoum, complaining of discrimination and neglect. Pro-government Arab militias then started a campaign of violence, targeting the black African population. 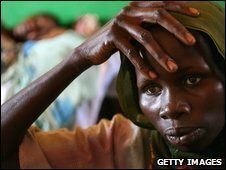 The UN says some 300,000 people have been killed in Darfur's six-year conflict. Khartoum says about 10,000 died. The African leaders, meeting in the Nigerian capital Abuja, agreed to the proposals in a report put forward by South Africa's former President Thabo Mbeki. The African Union will now have to establish a special unit to implement the recommendations contained in the report. Thabo Mbeki himself is asked to head a new implementation panel. This will have an enormous remit, not only helping bring into force the former South African president's own proposals, but also helping Sudan's troubled north-south peace process. Elections are planned for April next year, to be followed by a referendum on independence the year after. The timetable is tight and much needs to be done. To strengthen Mr Mbeki's hand there are now suggestions that he will in due course take over as the joint African Union-United Nations mediator in Darfur and the north-south process. This would be an enormous task, but Mr Mbeki is a man of keen intelligence and great patience - skills he will need if he is to succeed. Mr Bashir was invited to the meeting, but after an angry reaction from human rights groups, he stayed away. The BBC's Africa analyst Martin Plaut says Mr Mbeki's 148-page report is written in diplomatic language, but makes clear that previous attempts to dispense justice in Darfur have made little progress. Neither the special courts established by the Sudanese government nor the ICC warrant are considered to have contributed to peace. Human Rights Watch's Georgette Gaignon told the BBC's Network Africa the organisation welcomed the proposal. "It's part of the whole package of providing justice to victims in Darfur," she said. "There are many who have suffered in Darfur and there are many alleged criminals. "These people should be tried in a domestic system that conforms to fair trial standards, but the most serious cases are now before the International Criminal Court and those should be dealt with there." She added that it was important that the court was set up as quickly and efficiently as possible. But the response from the Sudanese participants in the Darfur civil war has been less than enthusiastic. Sudan's Vice-President Ali Osman Taha, who was at the Abuja meeting, said the proposals needed closer scrutiny to see whether they were in line with the constitution. One rebel group, the Justice and Equality Movement, described Mr Mbeki proposals as impractical, but did not reject them outright.